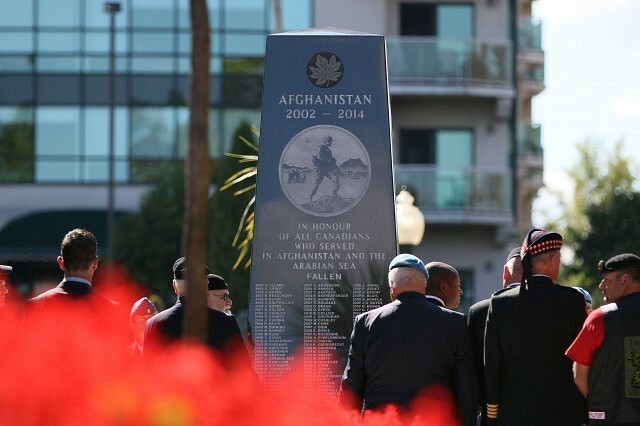 The Afghanistan & Peacekeepers Memorial was dedicated in September 2014 in Reaume Park. The south face is the Peacekeeping memorial. A Canadian Peacekeeper observes from a mound of rock on the water’s edge while on mission overseas. This digitally designed depiction with the United Nations and NATO flags on display represents the calm commitment a Canadian Solider brings. The monument is in honour of all Canadians who served with the United Nations and the North Atlantic Treaty Organization in Peacekeeping and Peace Enforcement Operations. is in honour of all Canadians who served in Afghanistan and the Arabian Sea.